Inspired by Alex Moseley’s Play-at-Work session at the Counterplay conference we want to collect 101 little ways you can add a little playfulness into all those meetings you have to attend. Kicking off with the ones we discussed at today’s online Show and Tell meeting but please comment and add your own. Just a line to inspire you to give permission to you and your colleagues to add a playful twist. Introductions. Rather than go round the table, everyone is given a name card (eg. Luna, Erik…) and the person opposite was asked to give them a job title and department. Introductions. Introduce yourself as the chocolate bar you feel like today. Introductions. Introduce yourself and say what book you are reading at the moment. Apologies. Everyone is asked to apologise for something distinctly un-playful they do regularly at work. Rewards. Anyone who volunteers to take an action gets a chocolate coin. Minifigs. 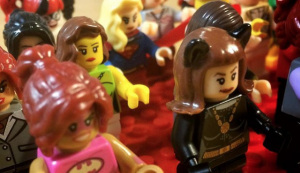 Minifigs are built as individual avatars and used to represent the student voice, or have their limbs removed for breaking meeting rules or waved to get attention. Elephants. A stuffed elephant can represent the elephant in the room and be thrown at people. Fiddlers. A box of buttons in the middle of the table adds something tactile to fiddle with. Biscuits. No tea or biscuits until agenda item number 3 OR No tea and biscuits if you are late to the meeting. Telephone Roulette. Dial a random extension and say hi. Make a new friend and compliment them. Idea Garden. A3 sheet of paper in thirds with ‘dirt’ (brown line), seeds and plants – and stick post-it note ideas on as seeds, plants or fully grown ideas! Visualise the development of your ideas. Dining Diversely. Volunteers bring food items to share to fuel conversations around culture or work/life balance (eg beans on toast) as a starting point for conversations about diversity. Blue tacos have made an appearance! …what else? Let us know and we can collate them. Then for the next meeting you are at pick a couple and give them a try! Turns out I left my phone at home today so I made a photoshop version. As promised, a pic to explain what I was trying to explain! 13. Randomness. Two people roll a dice: one to select the agenda item, the other to define the time the conversation must take. 14. Creative slots. At least once in each meeting, one item on the agenda is an open question / strategy need etc., which everyone then thinks about and represents their idea in a drawing, or clay, or lego, etc. 15. Discussions. Use an egg timer. For the first 3 minutes, everyone must provide a critical or negative point to the item; for the second 3 minutes, everyone must provide a positive or constructive point. 16. Collaborative agenda. Everyone has a piece of card. They each write an agenda item they’d like to cover on it. Everyone passes their card to the person on their left. On the new card, they add a smiley or sad face to the item, to show if they want to cover it or not in the meeting. Rotate around the whole group, and then the chair collects them up and runs through the 3-4 items with the most smiley faces. The views expressed on this site are the opinion of the author and do not necessarily reflect the views of ALT. Welcome! All those with an interest in play and games for adult learning are welcome to join.